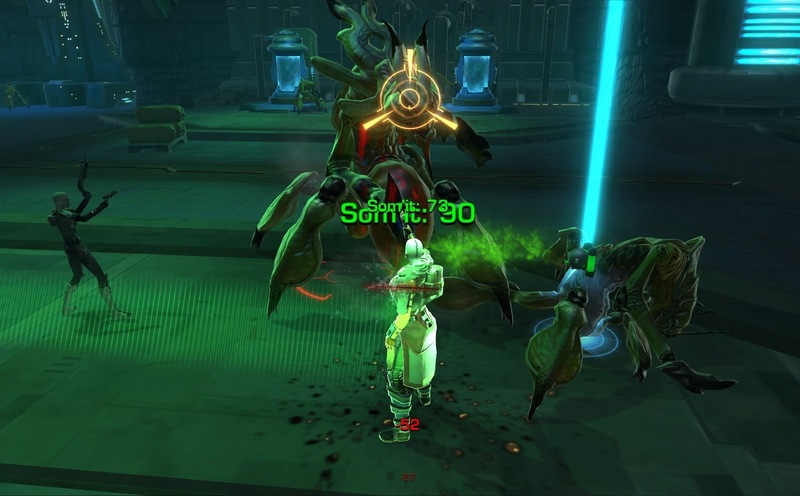 Going Commando | A SWTOR Fan Blog: Who's the tank? Mine and Pet Tank's newest alt levelling project is one featuring role reversal, which means that effectively I am the pet tank (of the Powertech variety), and he's the healer (an Operative). This is something that he already suggested several months ago, but at the time I still balked at the idea, which is why his Sith inquisitor ended up being a tank again and mine another healer. He loves to tank and I love to heal. Why mess with a winning formula? He wanted to try something different I guess, and I eventually relented, even though I kind of found myself agreeing with the guildie who, after being told about this project, laughed at us and predicted that we'd both end up hating it. So far it's been going okay though. I'm not completely new to this whole tanking thing, as I used to have multiple tanking alts in WoW. Actually I have some very fond memories of tanking instances for friends in that game, but it never felt like my "true calling" in the same way that healing does, and after the introduction of the dungeon finder I frequently found myself tanking for pugs that just made me hate the whole thing. Levelling with a healer friend obviously means that I'm spared from having to deal with such nuisances in SWTOR, which is good. We've run a couple of flashpoints with pug dps, but most of them have been nice enough and at worst one or two of them weren't particularly competent at their role. If anyone's giving me headaches it's actually my usual pet tank with his high expectations! "No, you should have charged the one on the right instead and pulled the left one over. I thought you would know that after watching me tank this so many times..." I'm usually a healer - I don't watch you; I watch your health! Fortunately most of it isn't exactly rocket science, and it usually doesn't take more than one or two pulls to drive home the point of which mobs are ranged, which ones have knockbacks and so on and so forth, and for me to deal with them accordingly. The really funny thing however has been how this reversal of our usual roles has affected my thought and behaviour patterns. My favourite example of this was when we were duoing a [Heroic 4] on Balmorra. We were quite over-levelled for it, so we didn't bother with crowd control and I just tanked everything. For the most part this wasn't an issue, especially as Mako is still my only companion and always throws some heals on me as well. Pet Tank Healer managed to finish off the pull on his own and then apologised to me in a somewhat sheepish tone, with the words: "I was distracted." I just sighed. "I know." "Wow, you sound almost as exasperated as I do when you let me die." "And you sound about as guilty as I feel when I let you die due to having been distracted myself." "Now you know how I feel," he said, hurled a grenade into the next group of mobs, and I chased after him once more to taunt and harpoon the elite mobs that were now trying to chew his face off. At least I pretty much never pull for him on purpose when I'm healing... I just have this unfortunate habit of accidentally backing into things. Then again, maybe he can't really help himself either, considering that he's so used to being the tank and charging ahead at all times. Haha, what are you "hoo boy"-ing about...? Well, WoW warriors and bear druids have Charge... (and I can't wait to get Jet Charge on my Powertech, because just walking into every pull simply feels wrong). I just have this unfortunate habit of accidentally backing into things. I fondly remember how I kept accidentally running into camp after camp of Gnolls while my wife and I were peacefully roaming the plains of Westfall a couple of years ago when we were still playing WoW. To this day she keeps teasing me about this and similar events like that. Somehow it’s always me who stumbles into extra groups. One question: this “pet tank” you keep referring to a lot lately, is he your significant other (boyfriend? husband?) or is he just some “random” friend/guildie? :wink: Not that it’s any of my business, of course. I’m just curious. Haha no, I tend to refer to my significant other as... "my significant other". :P But he doesn't really play anymore, so he doesn't tend to come up as much in my posts here. Pet tank is someone I met in my current guild. I love to heal, he loves to tank, we both enjoy levelling alts - it was a match made in gamer heaven. :P As such we do spend a lot of time playing together - and bickering like an old couple, so your confusion here is understandable, lol.